Ever since I discovered and got to learn more about Korean skin care products, I have been a fan who constantly checks out beauty shops online who sells these kinds of stuff. My most visited site would have to be Althea Korea as they have the most affordable and have the most selection of brands. In my last beauty post, I've purchased 2 of their limited edition boxes. If you don't know yet, these are specially curated boxes by the Althea fairies in Korea. Released every month, these limited edition boxes are themed to the latest KBeauty trends and fads from Seoul. Unlike the conventional beauty box, Althea Beauty Box has no surprises (heart attacks), no subscription payments and they contain full-size products, shipped directly from Korea to you (You can smell Korea in it). Althea Boxes are sold at a killer price so everyone can try KBeauty products without flying to Korea. And now, Althea has done it again! For their 12th box, they named it The Anti-Pollution box and the products inside it are such a steal! I wasn't really planning to buy another box as I've said to myself that I need to save up and be frugal as much as possible. 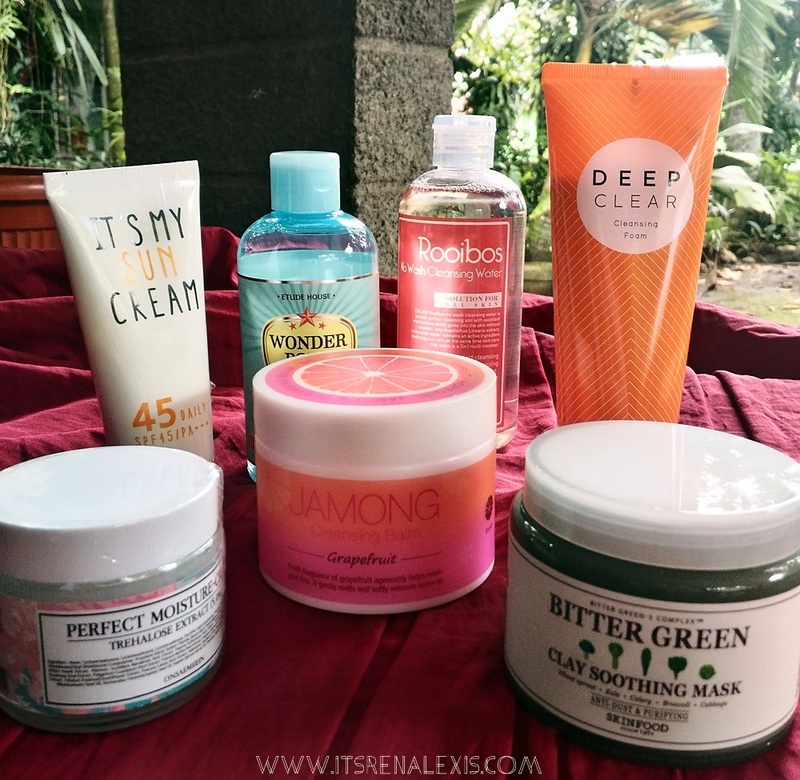 I just originally wanted the Etude House Wonder Pore Freshener which was the best toner according to the ALTHEA BEAUTY AWARD: 2016 BEST KOREAN SKINCARE, as I was looking for a product to care for my humongous pores. And when I saw that it was included in the new box, I told myself that I have to have it, so I did. The box arrived at my doorstep two weeks after I ordered it. I was so excited to see a golden Lunar New Year box and when I opened it, ahh, it was skincare heaven. It was love at first sight and to think I just paid 71% off of its original price! Here are the seven products that are included in the box. Hope Girl Jamong Cleansing Balm (75g): It gently cleanses off any impurities on your screen. The mild formula with grapefruit extract protects your skin barrier while purifying them. Calmia Rooibos Cleansing Water (300ml): Bubbles from sparkling water effectively removes fine dust. A mild formula including Rooibos extract creates a hydrating layer onto your skin. Etude House Wonder Pore Freshener (250ml): Calm down your skin which had suffered from the harsh environment. Remove any impurities which remain even after cleansing. Plus, rebalance the pH level of your skin as slightly acidic, for a healthy and youthful skin. Skin Food Bitter Green Clay Soothing Mask (145g): A haze-blocking mask that prevents the fine dust from sitting onto your pores. Also, the soothing mask fortifies the skin barrier which is vulnerable from such irritation. Onsaemeein Perfect Moisture Cream (70ml): Does your skin suffer from irritation and redness, due to fine dust? Rich in Trehalose, Perfect Moisture Cream instantly hydrates and soothes your skin. Missha Deep Clear Cleansing Foam (150ml): Dense, micro bubbles deeply cleanses off any remaining makeup residues or impurities. It's My Daily Sun Cream (50ml): Treating your skin before leaving the house is also important to protect your skin from the haze. Apply sunscreen with a high SPF to create a shield on the skin and reflect all the UV rays! I have tried every product already and I've incorporated them into my skin care regimen. I would say, my favorite in this box would have to be the Missha Deep Clear Cleansing Foam. I love its subtle smell and its cleansing powers. It does not disappoint, after every wash, my face feels squeaky clean! And you only have to put a small amount in your palm, the formula lathers up and just cleanses all the makeup, dirt, and oil from your face. I use this one every night after the cleansing balm or oil, and then alone in the morning. The Jamong Cleansing Balm, on the other hand, is also a great product. It cleans the face well like the Perfect Facial Deep Cleansing Oil I was already using. One thing I don't really dig is its smell. At first it's very fruity and citrusy but in the long run, it turns into something strong, like that of a car perfume you just hate because it makes your head ache. So I only use this balm once in a while. I've tried using the Rooibos No Wash Cleansing Water one time when I came home from roaming the city. I was wearing a good amount of makeup then and I just decided I wanted to try how this product works. Surprisingly, it does a great job of taking off all my makeup. Like seriously, it did take off everything, even the waterproof mascara I was wearing. And it was fragrance-free which is a big plus for me. It was my first time to hear about the Bitter Green Clay Soothing Mask from Skinfood. I have used it once last week and the first thing I noticed about it is its weird smell. It has this minty, kind of bitter-y fragrance and its appearance is like a jiggly whipped cream. It gives off the impression of being healthy because it has kale, celery, broccoli, and cabbage in its ingredients, among others. When I applied it on my face and had let it sit for about 15 minutes, it hardened and I felt a tightening sensation. After I washed it off, my skin felt cleaner. I have yet to use this more often to find better results, hehe. Another product I liked in this box is the Onsaemeein Perfect Moisture Cream. I love its smell and its moisturizing effect. It is lightweight and is easily absorb by my skin so it's perfect to use in the evening as well as in the morning. And you only need a small amount to cover your whole face, this product will really go a long way! Lastly, the It's My Sun Cream. I have the other variety of this one (waterproof sun cream) from my last beauty haul, and the difference between the two is that this plain one is more lightweight than the waterproof one. They smell the same but the formula of the waterproof sun cream is thicker than this one. When applying it, I can't really choose which one I prefer because they're just so similar. hehe. So that's it with the Anti-Pollution Box! I really loved this box and I have not regretted buying it because it's so sulit! I'm still on the lookout for products that will be my "holy grail" but for the meantime, I'm pretty satisfied with the products I am currently using. PS. Should you want to purchase from Althea, click this link so that you can have 350 pesos worth of discount on your first purchase! Happy shopping!